When I first started writing about personal finance back in 2006, I was big on the “rules.” Since I didn’t know much about money management — beyond the fact that, to that point, I hadn’t been great at it — I wanted rules to help me stay on track. While rules of thumb can be a great starting place for your finances, and help get you on the right track, the fact of the matter is that personal finance is personal. Just because it’s a general rule, or a good starting point, doesn’t mean that it’s always going to be the right thing for you, even if it’s worked wonders for someone else. I agree that you need an emergency resource to draw on when you are in a pinch. However, I don’t agree that you should keep most of it in a high-yield savings account. The argument can be made that you should make sure that money is liquid and safe, but I still don’t buy it. Instead, I keep the bulk of my emergency fund in a taxable investment account. I do have about three weeks’ worth of expenses is a high-yield account, so that if I need the money right now I can get it, but most of it is in the investment account. I have just enough in very liquid assets to hold me over until I can liquidate some of my investment account. The money is invested in a combination of index funds and dividend aristocrats so that it is earning a return much better than a savings account, but still risk is limited because of the index fund. While this might not work for you, it’s worth considering. Why have that money under-earning for you when it could be working on your behalf while at the same time shoring you up against an emergency? Once you drive a new car off the lot, it depreciates significantly. This is one of the reasons that, for our first two car purchases, my husband and I focused on lease returns. We could still get a car under warranty, but most of the initial depreciation was taken on by someone else. However, that changed when we bought the third car of our marriage. We ended up buying new because, at the time, conditions meant that a new Subaru actually cost less than a used car. We got a good deal at the dealership, a financing arrangement that I still don’t regret, and a brand new car with full warranty and almost zero risk of breaking down. After selling my home and moving across the country, I may never buy again. One of the “rules” is that buying a home is better than renting, but I’m not so sure. I think there are cases that renting is better — even when it comes to the long term. In fact, I ran the numbers. Owning a home costs more than renting in many markets (even with the tax deduction for mortgage interest and property taxes). If my family had rented, we could have invested the difference between the rental cost and owning cost, and come out ahead over the last seven years. Plus, when you rent, someone else is in charge of all the maintenance and repairs. It’s a lot less hassle, especially as the home ages. So, what do you think? 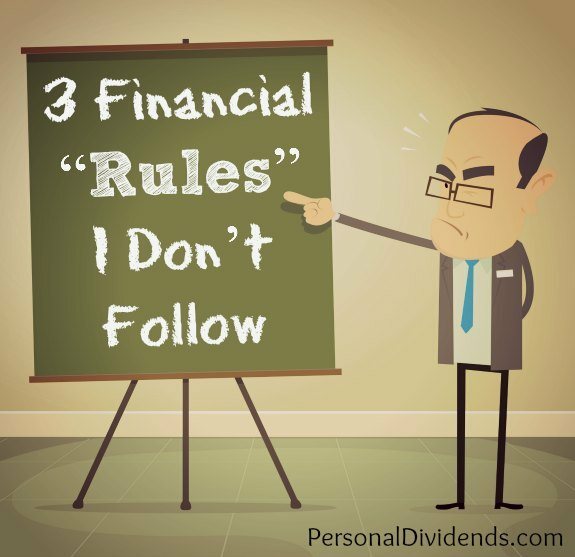 Do you break any financial “rules”? Nice article. I agree 100% with rules 1 and 2. I do, however, think owning a home is better than renting. I suppose it depends on where you live though. I’m in an area where home prices have increased substantially so of course I’m biased.